Our current home served us well for fourteen years, but we were ready to move on. And we were very picky in our must-haves for that new place. The main reason we wanted to move was so my husband could get licensed to start his own nano brewery. In order to do that, we needed a detached shop or garage that would be used solely for the business. Of course, I didn’t want to go to all the trouble of moving unless our new place was also an upgrade from what we already had. Who doesn’t, right?! I’ve always wanted a bigger piece of property for a kids/dogs’ play area as well as more potential gardening space, which is one of my favorite hobbies. A little bigger home wouldn’t be bad either, so each child could have their own room, my husband could possibly have an office that isn’t our bedroom, and I have always wanted two sinks and a big, soaking tub in our master bath. My husband also really loves one-level, ranch style homes for his poor knees and to alleviate my fears of becoming a widow when he goes on the roof. Not all of those were deal-breakers, however, and the more my husband and I discussed it and saw the lack of options that existed in our small town (not to mention our shortage of riches), the more we knew we were going to have to make some compromises. One thing, however, we could not compromise on, was the space for the brewery, so we began to view each potential home through that lens. By the time we listed our home, this particular property had been on the market for over three months with what seemed like very little interest, but they had yet to lower the price. We believed it was over-priced for the work it needed and way over our budget. As such, we hoped that by the time we had an offer on our home, we could convince them to accept our low bid. The following week, however, I saw another home online that was more in our price range. I immediately sent the address to our realtor and got a showing for the next day. At the time, we didn’t think anything of it and took all three kids with us to see it. Bad idea. It was CRAZY trying to wrangle them to follow us and keep them from playing with (or breaking) the homeowners’ stuff and terrorizing their pets. All the while, my husband and I attempted to judge if it was the right place for our family and our new business. So, by the time we were ready to put our first offer down on the property with the huge lot and shop, we got a sitter for the kids so we could walk around it, inspect every nook and cranny and write up our offer in peace. I highly recommend it as the only way to do this with young kids. Over the next three months, we looked at several more properties. A nice little place with a shop that would work, but the house would not. Another out-of-date, overpriced place with a shop and a seller that refused to negotiate on price. And a century-old farmhouse I had been hoping for months would go on the market, but was already pending by the time we could get a showing. Then, there was the beautifully-staged pictures in a listing for a large house way out in the country, but when we drove up were shocked to see they had used decade-old pictures. In real life the front porch was falling off the house, multiple families were living inside and it had soiled carpets, holes in the walls, cigarette ash piled everywhere and a kicked-in front door! I started to get disheartened. I scoured real estate apps every night and for weeks there were no new listings for us. At the same time, I knew we didn’t have an offer on our home yet, and I hated the thought of finding a place that we loved, only to be bumped by another buyer. Finally, a huge daylight ranch home with no shop, but a lot of potential came on the market. We got a sitter and spent an hour looking the place over. My husband instantly loved it, but I didn’t. There was no garden, the yard was slightly sloped and needed new fences. The inside was more than roomy with a large downstairs and bonus rooms galore, but I worried about how much it would cost to put in a shop and the other fixes needed to make it livable. Still, we kept it in the back of our minds when we got an offer on our home the following week and pressed to commit to closing and possession dates. Thankfully, our buyers agreed to give us one more weekend to look. I searched for new listings, hoping and praying to see something that would work. I saw one in a town over from us, not my preference, but not a deal-breaker either. We quickly got an afternoon showing for the next day, but had no childcare so we brought the kids with us and let them watch a movie in the car while my husband and I took turns looking at the house. I love it. It was beautifully remodeled inside with a nice garden outside and a couldn’t-be-more-perfect spot on the side of the property to build a shop. But my husband did not like it at all. I spent the afternoon miffed at him because I loved the granite kitchen countertops, the luxurious master en-suite and a garden I wouldn’t have to start from scratch. After a couple hours I cooled off and realized that he was right. The spot for the shop would work, but not much else. Even though the house was larger than our current home, the two living rooms were actually smaller. So we kept looking, knowing that if we didn’t find something before the weekend, we would be putting an offer on the daylight ranch we had seen a week back. And I did not want to do that! Providentially, another home popped up that evening; a 1940’s one-level charmer on just under ½ an acre. I showed it to my husband and he wasn’t impressed. 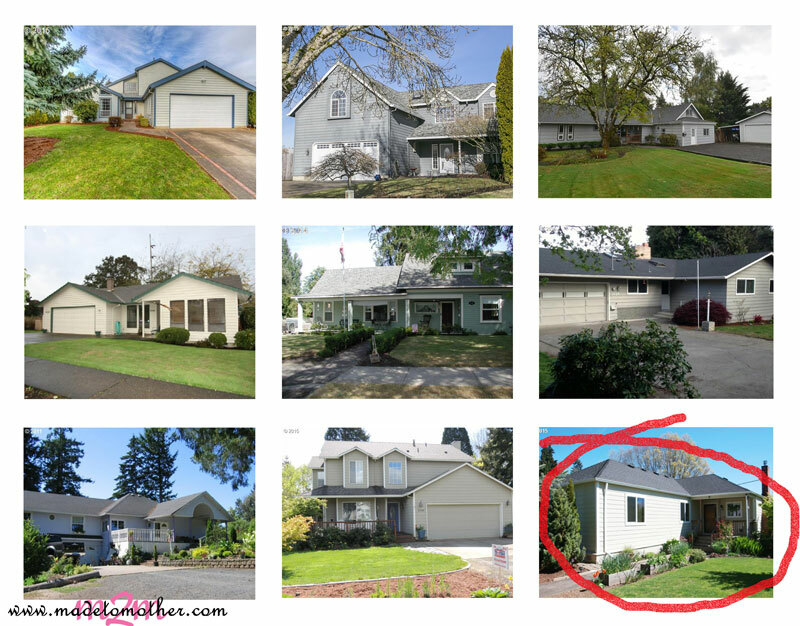 The pictures did not make it appear updated, and although it did have a detached garage, it was only three bedrooms and listed as 100 square feet, one living room and bathroom LESS than our current home. However, we agreed it was worth a shot and texted our agent to see it. The next afternoon, again, with all three kids in the minivan watching a movie, we went to see the little house on the big lot. The home did feel small, but the kitchen, dining and living rooms were almost completely open-concept with updated features, and its two bathrooms were very large with beautiful soaking tubs. What made us completely stop in our tracks, though, was the amazingly huge, landscaped backyard. The freshly-cut lawn went on for what seemed like forever, stopped only by fragrant, blooming fruit trees, pots of flowers and an abundance of berry bushes. And, best of all, way in the back, was a large, freshly-tilled garden waiting for me! Next to the house was a very adequately sized, detached garage that after some remodeling would work fine for a brew space. The lot also had two smaller sheds, a covered patio and three separate decks, but at that point the rest of the property could have been hideous. All I cared about was that gorgeous land! I wanted it and so did my husband. We discussed our offer with our realtor on the spot, giving the sellers their asking price not 24 hours after it was listed! After writing up the offer we felt confident allowing our children to see the home we hoped to buy. We let them run around and squeal over the yard, where the doggies would live and who got which drawer in the bathroom. It felt right to bring them into the process, valuing their childish opinions so it could truly be a family decision where we were moving. Another day later, the sellers accepted our offer without even countering! And just like that, within one week, we were selling our home, buying another and moving in 33 days! —> Read Part 3: A Journey with Negotiations, Paperwork and Boxes here! Thank you for sharing the story of finding your new home. During our last move I only had my eldest who was a baby. So, our move wasn’t quite as adventurous. I hope you have a great day! Wow, what an adventure! Praying your move goes smoothly! Thanks for sharing at The Weekend Brew! Thanks for the prayers and for reading, Barbie! Your story sounds so much like ours. We have four children and we have outgrown our house. We have spent the last year dreaming of that prefect house. We were not quiet ready a year ago financially for what we need so we have spent the last year working on getting there. We feel like in July we will be ready to list our house. But during this last year we have looked at a lot of houses and most days been sad because we have found nothing that has fit our needs. Right now there is currently a house on the market that does fit our needs almost to a T. The house is everything plus some but its a little farther out than we want but we love the house. So we are praying in July when we are ready that it will still be available. Definitely sounds like us! Keep your hopes up. It WILL work out when it’s right, and if it’s not that home, an even better one for your family will pop up. Good luck and thanks for reading today! We had one move that sounds similar to yours. We were never at peace about each house we viewed. I think it was because we actually should not have moved at all, but that is another story. Eventually we moved and when it came time to sell, there were hidden liens on our property that cost us several thousand dollars to pay off. Our Title insurance covered some, but not all so we absorbed the cost. Hopefully everything will fall into place for you in your new place. The yard is a blessing, and perhaps the house can eventually be added on if you need an extra bedroom. Thanks for sharing with us here at Tell me a Story. We have definitely had those times where it was clearly not the right time. Thankful today that we listened. Thanks for always reading, Hazel. Have a great week! Oh, how your story of bringing along your little ones as you looked at houses sounds so familiar to times we’ve done this also. We are getting ready to move again (move #14 in 12 years of marriage). It was fun to read about your adventure in finding a new home. We are looking forward to settling down for the first time in our marriage in the home we are about to move into. I am very much looking forward to it! wow, 14 times in 12 years, you must be a pro! do you have any tips for me? blessing on your next move and wishes for a long stay in this new home of yours! Thanks for reading! We might be selling and moving closer to our church this summer, so I read your post with much interest. So happy to be next to you at Lyli’s! Wow! What an ordeal but it looks and sounds like you got an ideal new home. Congratulations! I hope your move goes smoothly. Thanks, Jennifer and the same to you! Good luck on your move and thanks for reading! Thanks for sharing this post about your move at the Thoughtful Spot! Great story! I can remember looking for new houses with the addition of child #2 and again with child #4. They love to hear the stories as well. Wow, I cannot imagine. Thanks for reading today! Moving with 3 kids is really an adventure! Good luck with the move! Thanks for sharing! Greets! House hunting can be such a fun adventure or completely stressful. Congrats on the new house! Thank you for sharing them with us at the Let’s Get Real Link Party. I hope you’ll join us again.